Former Ukrainian President Viktor Yushchenko has warned that Ukraine is falling out of the international spotlight, comparing his country to an “annoying fly” everyone is bored with. A new format is needed for resolving the conflict in Donbass, he said. “The world is getting tired of the Ukrainian question,” Yushchenko toldSegodnya. “We’re not even second or third on the agenda anymore – Ukraine is being swatted away as an annoying fly.” He added that the issue of Ukraine has become mundane and the international community is not paying as much attention to it anymore. Yushchenko stressed the need to move to a new format where the EU, Russia and the US should get involved in negotiating an end to the conflict in Ukraine. He also said that the loss of financial stability in Ukraine had led to greater economic damage than the war waged against the rebels in the east of the country. In 2014 alone, Ukraine lost $US 12 billion in foreign investment while the public withdrew more than $9 billion from Ukrainian banks, Yushchenko said. “If you lose financial stability and control over prices and money, you lose not only the capability for economic development but all other social issues,” he said. 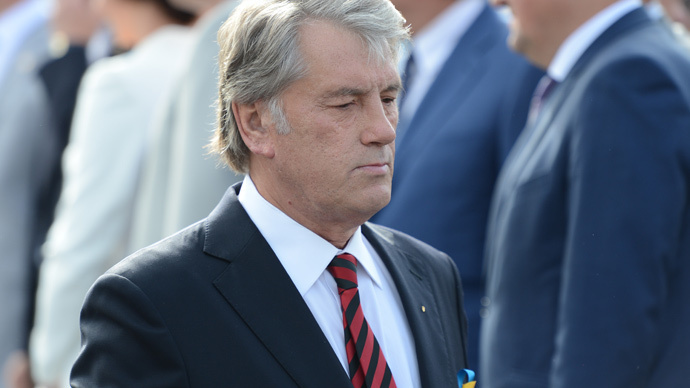 Yushchenko was the third president of Ukraine from 2005 to 2010. He was brought to power in the wake of the pro-Western Orange revolution, but by the end of his tenure he saw his support evaporate and he was replaced by his rival, Viktor Yanukovich.